Arthur J. “Red’ Barth of Milwaukee, Wisconsin was one of the founders of the Central U.S. Ski Officials Association formed in 1935. He served as the first secretary. He was the founding editor of CENTRAL SKI SPORT for 22 years. He was an international ski jumping judge, served as chairman of the National Jumping Committee and was the first American Olympic ski jumping judge in Europe. He was also president of the National Ski Association in 1949. Arthur Barth was born in Chicago on July 7, 1902. Growing up in Racine, Wisconsin, he sparked the initial meeting of the Racine Ski Club in the Barth home. After moving to Milwaukee Barth was always involved handling meetings at the old slide in Gordon Park during the 1920’s. In 1934 he was selected as a member of the American Olympic Committee to choose the team for the 1936 Olympics. In 1938 the U.S. Secretary of the Interior appointed Barth to serve on a national committee to formulate policies and practices for recreational areas throughout the United States. He served without salary or travel allowance. His involvement in skiing included him co-founding the Central U.S. Ski Officials Association. After serving as president and secretary of the CUSSA, he went on to serve the National Ski association in the same capacities. He was president when the first World Ski Championships in the United States took place at Aspen, Lake Placid and Rumford, Maine (Nordic events) in 1950. Because of his many worthy accomplishments, he was made an honorary director of the NSA until his death at the age of 53. He was also the founder of Central Ski Sport for over 22 years the official CUSSA newspaper. “Red” Barth was employed as foreman in the bottling house at Pabst Brewing Company. He had a reputation for never being too busy to serve the local Milwaukee Ski Club in various official capacities. In fat, any individual or group felt free to consult him for assistance, as did the 10th Mountain Division for whom he recruited men in World War II. The Julius P. Blegen Trophy for outstanding contributions to skiing, the NSPS Trophy of 1955, the CUSSA gold medallion – these are honors held by Arthur Barth. Although he loved skiing in general, jumping was his forts. He achieved his greatest honor as the first American judge to officiate at the Winter Olympics at St. Moritz in 1948. Always studying, improving, encouraging the jumpers, he served in turn on committees for the NSA and FIS. In 1954, with the aid of Chuck Warren, he selected the FIS jumping team. He became one of the foremost authorities on ski jumping in America, judging at many international events. He served as the first president of the National Ski Museum Corporation (1950), a project he had worked on since 1944. On February 19, 1954 Barth dedicated a “shrine to the skiing world”, the National Ski Hall of Fame and Museum “to those who have gone on and those who are with us”. Widely traveled because of his various appointments and involvements, he had no trouble finding a friend to share his love and enthusiasm for skiing, something that remained with him throughout his life. Arthur J. 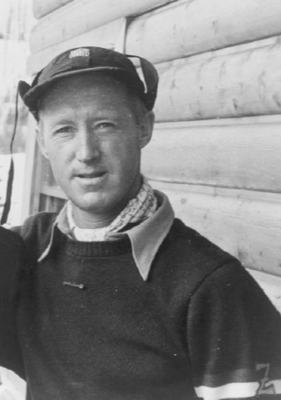 “Red” Barth was elected to the U.S. National Ski Hall of Fame in 1956, the second person to be so honored. If you notice any errors or inconsistencies in Arthur J. "Red" Barth's bio, click here to let us know.